Encase and display the exemplary career of a serviceman par excellence with a presidential flag display case. 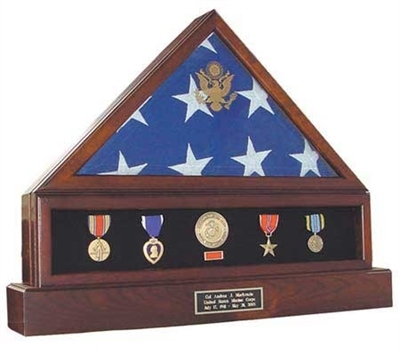 Each presidential flag case – available in heirloom walnut and cherry finish – is a genuine all-American product that also includes a medal display case, a full-length pedestal urn and a free basic brass nameplate. Includes full length Pedestal Urn. Designed to accommodate a 5' x 9½ ' burial flag. The "Presidential Setup" features the Presidential flag case, the medal case, and the full length urn pedestal manufactured right here in the USA. Available in Heirloom Walnut or Cherry finish. Each flag case is assembled by hand utilizing an incredibly strong glued Dovetail joint then put through a seven step finishing process. Designed to display the american burial flag and to set on a flat surface or hang on a wall.